Posted By:Unknown | At:12:51 AM Be the first to comment! The NAACP is joining Newt Gingrich in calling for a reduction in the number of state and federal prisoners and spending the savings on education. The National Association for the Advancement of Colored People released a report on Thursday that said between 1987 and 2007, state prison spending grew at six times the rate of higher education spending. It recommends examining policies in states that have reduced their prison populations. 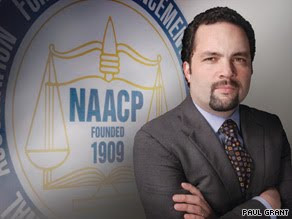 "For 30 years we've been practicing failed crime policies that don't make us safer, in fact they make us less safe and cost billions of taxpayer dollars," said Benjamin Todd Jealous, president and CEO of the National Association for the Advancement of Colored People. "It's time to get smart on crime and stop pretending we're tough on crime," Jealous said. "Smart on crime is policy based on what works. Tough on crime is about good PR, like responding to drug offenses with mass incarceration. Smart is rehabilitation." Gingrich, a potential Republican presidential candidate, noted that $68 billion was spent on incarceration last year in the United States, even though some states have reduced their costs with alternative programs. "It is time to fundamentally rethink how we treat and rehabilitate our prisoners," he said in a statement. Others backing the report include Grover Norquist, president of Americans for Tax Reform; Rod Paige, who was Secretary of Education under President George W. Bush; and Mike Jimenez, an executive board member for the prison guard group Corrections USA. Norquist said his group got involved because when it comes to making the argument for reducing the number of prisoners, "liberals can't do it. People say, 'You just want to let all the murderers out.'" "But we are spending a great deal of money keeping people in prison, and for many of them it doesn't make sense to keep them there year after year," Norquist said. "Some do better with things like home confinement, probation, ankle bracelets, rehabilitation, all of which are much less expensive. We can do this in a serious way and still keep the crime rate down." The report's recommendations include: a commission to study and recommend reforms; eliminating sentencing disparities between powder and crack cocaine; freeing prisoners earlier if they participate in educational, vocational, drug and mental health programs; eliminating mandatory minimum drug sentences; and diverting drug offenders to treatment. Norquist said his group thought any prison savings should be returned to taxpayers, not spent on education. "The NAACP wants to spend that money in some places that we don't," he said. "We can argue about that, but first let's save the money."